Bangkok (Thailand) – January 23, 2018 (travelindex.com) – Industry experts revealed at Thailand Tourism Forum (TTF) 2018 that Bangkok is on the cusp of emerging as the world’s next Mega City. Within five years, the rapid expansion of Bangkok’s Metro systems will succeed in opening up unprecedented spaces in the city and with it huge opportunities for the travel and tourism industry. This has not been lost on one of Thailand’s most prominent real estate developers, Sansiri PLC, who will bring one of the most dynamic New York hospitality brands to Bangkok – The Standard – in a major foray into hospitality as they seek to bring new cutting edge brands to the city. 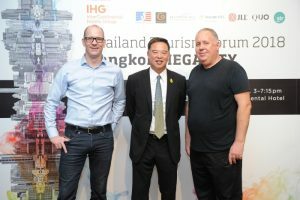 Global research firm STR’s area director Asia Pacific Jesper Palmqvist added that Bangkok was on a strong growth trajectory in terms of hotel performance and infrastructure development would only support this further. “With almost three years of stable growth in terms of hotel performance, Bangkok has firmly put the 2014 decline far behind. By November 2017, RevPAR had grown 3.4% year-over-year, and this against a backdrop of some reasonable strong supply increase at 4.1%. In addition to Apichart Chutrakul, CEO of Sansiri PLC, speakers and panelists at TTF 2018 included Dillip Rajakarier, CEO of Minor Hotel Group; Supoj Chaiwatsirikul, Managing Director, ICONSIAM; Nikhom Jensiriratanakorn, Director of Horwath HTL; Thomas Schmelter, IHG’s Director of Operations for Thailand & Indochina; Mike Batchelor, JLL’s Managing Director, Investment Sales for Asia; Jesper Palmqvist, STR’s Area Director for Asia Pacific; Thomas Schmelter, Director of Operations – Thailand & IndoChina, IHG Group; and many more.